Grapefruit Essential Oil (Citrus x paradisi) is also commonly known as Forbidden Fruit. Grapefruit Essential Oil has a medium-strength citrusy, fresh, and slightly bitter aroma presenting a top fragrance note. Part of the Rutaceae family, Grapefruit Essential Oil is part of the Rocky Mountain Oils Energy and Cleaning collections. The bright, clean scent promotes balance from everyday mental fatigue while aiding in sharp mental function. Diffuse Grapefruit oil to encourage a joyful mood. Spritz the fresh-smelling Grapefruit Essential Oil around your home, or use as a cleaner to lift the mood and purify the air in your house. Grapefruit is used in detergents, soaps, and other DIY household cleaners. Learn more ways to use Grapefruit on the Rocky Mountain Oils Recipe Book! 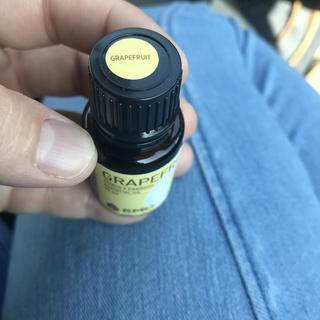 I’ve always had a top 3 favorite essential oils but I’ve just added a 4th to my list and grapefruit is one of them! It’s got an amazing aroma! This grapefruit oil smells absolutely amazing. I could smell it all day! I love mixing it with peppermint oil and breathing it in for a pick-me-up in the afternoons. The smell really help with mood and energy for me. 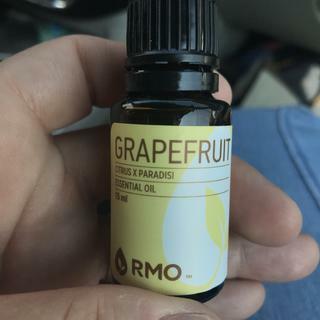 Can't go wrong with RMO Grapefruit! Grapefruit is also a great citrus choice. I love all of RMO'S citrus oils. Wonderful fresh scent. I love to diffuse to freshen the air. I LOVE RMO!!! The Grapefruit is awesome along with all the others I have purchased. I would highly recommend this product. I love this grapefruit smells so good. I used this morning in my dfussor. Great price for an essential oil that can be used in many ways and diffused with other oils. One of my favorites is grapefruit, orange and lime. You can even add a few drops of lemon. Bright, clean, fresh scent when diffused. Helps to cheer up moods and assist the feeling of happiness. Smells so fresh and clean! Great price on this! This spring I'm really into citrus smells. This oil smells like I've just cut open a grapefruit and am ready to dig in. I purchased to use with an inhaler to curb appetite. Does that include eating grapefruit? ?? I've also used it in the diffuser on a sunny day. Brightens any mood!! I still need to learn other ways to use it. Nice to put a couple drops in my hands and rub them together to smell if having cravings or hungry. And something about this fragrance is very uplifting to me. Love, love, love it...! This is one of my favorite essential oil’s. It’s such a happy sent. I use it on my face at night to even out my skin tone. Just don’t use it on your skin during the day because it will intensify the suns rays and damage your skin. Smells like heaven and helps keep this sleepy mama energized throughout the day. I was researching essential oils and grapefruit was brought up many times to help with weight loss. I add this to my diffuser while I am at work (where I tend to snack all day long) and I find myself not wanting to snack and not having cravings for suites. This product is great. This has become my new favorite oil. I wear it in my diffuser necklaces and I absolutely love it. I think it smelled very similar to orange oil but it's still wonderfully delicious. Very bright and uplifting! Wonderful and invigorating! One of my favorites! I use this one daily. The smell is very pure! I have used it everyday! I diffuse Grapefruit and Lime together and always get compliments on it. Its invigorating and refreshing and helps us focus while we do homeschool. My favorite combo! This is a delicious and energizing scent. Loved the clean smell of grapefruit. The quality was just as I expected it to be, perfect. Smells wonderful in my cleaning products. This is my go to scent for summer. I love the fresh, clean citrus scent. I mix this with rosemary and blast away bad odors in my car (stinky pre-teen summer time problems). I love the clean scent! I love this scent - nice and refreshing! Great oil. A must have! One of my favorite single oils. It smells fabulous. It's great for diffuse or applying topically. And your standing in a grapefruit orchard. Calgon takes you away, so does this! I personally especially love this one. It has such a sweet, citrus scent, and I love to diffuse it for an energy boost and mood lightener. Definitely a recommended buy. I defuse grapefruit and I put it in my drinking water along with a few other oils to aid in weight loss. Love RMO as I feel they have a quality product. Can this oil be taken internally? Like put it in water? I don't know why they don't put it on their label, but the do publish it on their website. I spent many months online investigating EO's four years ago when I first started using them. When I decided I wanted to start using EOs eternally, I wanted a pure product. The first few bottles I bought were not a quality brand from a local health food store. In my research I determined that RMO's product was pure and safe, and not the other brand I was using. I have been using RMO oils as I said for 4 + years, both to topically and internally with no adverse effects, and no problems. I recently ran across an old bottle of cinnamon of the other brand I had originally purchased back then and I opened it and smelled it, then smelled the RMO cinnamon and, wow!, what a difference. I could smell the other brand had a very chemical smell. I love RMO, love their product, and it is the only brand of EO's I use. I started using them when they were Native American Nutritionals and continued when they merged with RMO.